ARE WE READY FOR HIS (A.T.F.S. )'s REAPPEARANCE ? "YA ALLAH, GIVE ME MORE PATIENCE. YA ALLAH, IS THERE ANYTHING ELSE I CAN GIVE FOR YOUR SAKE?" He remained patient after seeing so many dead in one day. Allah's will was Husain's command. Husain (a.s.) was prepared and willing to sacrifice his family. He never prayed to Allah to save his family. Instead he prayed for PATIENCE! PATIENCE! AND MORE PATIENCE! By Asr time Husain (a.s.) was left alone. The time had come for Husain (a.s.) to go to the battlefield. Husain (a.s.) said KHUDA HAFIZ to everyone. Husain (a.s.), with his sword ZULFIQUAR on his waist, mounted ZULJANA, his horse. "IS THERE ANYONE TO HELP ME? IS THERE ANYONE TO HELP THE GRANDSON OF THE HOLY PROPHET?" With this call, the grandson of the Holy Prophet, was giving one last chance to Yazid's men, the men who called themselves Muslims - the followers of the Holy Prophet. No one answered Husain's last call. But Husain (a.s.) heard the sound of crying coming from his camp. Husain (a.s.) turned around and returned to his tents. "Zainab, your brother is still alive. Why are you crying?" "My brother Husain (a.s.), when you called out, "IS THERE ANYONE TO HELP ME", Ali Asghar fell from his cradle." Husain (a.s.) knew what Ali Asghar was trying to say. Husain (a.s.) went to Umme Rubab (s.a.). Ali Asghar was on her lap. He was crying and Umme Rubab was trying to comfort him. Husain (a.s.) picked up baby Ali Asghar and whispered in his ear. Ali Asghar stopped crying. He looked up at his father and smiled. "Umme Rubab, I am taking Ali Asghar to the battlefield with me so that I can get some water for him." "My son, Ali Asghar, do you want to come to the battlefield with me? Asghar, do you want to show your strength on the battlefield? Come, let us go, my little Mujaheed, my little soldier, Asghar." Umme Rubab changed Ali Asghar's clothes. Imam Husain (a.s.) carried Ali Asghar to the battlefield. It was very hot. Ali Asghar was thirsty. Husain (a.s.) covered baby Ali Asghar with his abaa, to protect him from the scorching sun. Yazid (l.a.)'s men saw Husain (a.s.) approaching with something in his hand. "Look, Husain (a.s.) is coming with the Quran. He has no one left to help him. With the help of the Quran he is hoping to win." Husain (a.s.) walked to Yazid's soldiers. By moving his abaa he uncovered Ali Asghar. "O soldiers of Yazid, you feel I have offended you, but what has this little child done to you? His mother's milk has dried up. He has not had a drop of water for three days. He is dying of thirst. I beg you to give water to this innocent little child." Not one of Yazid's soldiers brought any water for Ali Asghar. “Maybe you think that when you bring water for this child, I will drink it too. I will put this little child on the ground. You can come and give him water yourself." Husain (a.s.) placed Ali Asghar on the burning sand of Kerbala. Ali Asghar lay quietly on the hot sand of Kerbala. His turned his head and stared at Yazid's men. No water came for Ali Asghar. "My son Ali Asghar, my darling, you are too young to fight with a sword or a spear. My little Mujaheed, my little soldier, you are a grandson of Ali. Ali Asghar, fight your Jehad with your tongue." Little Asghar stuck his dry tongue out and moved it over his dry lips looking towards Yazid's men. He fought Jehad with his tongue. The little soldier shot a strange arrow - his dry tongue. It hit the hearts of Yazid's soldiers who had children of their own. They became restless. Some started crying. "Husain (a.s.) is saying the truth. What has this child done to us? Why is he punished like this? Let us give him some water." Umar Saad got worried that his soldiers will turn against him. The little soldier's fight was very effective. Little Ali Asghar was fighting Jehad his way. "Hurmullah! What are you waiting for? Silence the little child! Don't you know he is a grandson of Ali? Hurry, shoot your arrow, before it is too late." Hurmullah aimed an arrow at Ali Asghar. A small arrow for a little child? No! An arrow not with one head, not with two heads, but with three sharp heads. Why? Why an arrow with three heads for such a small child? My fellow Husaini! You will not be able to stop crying when you hear what happened next. 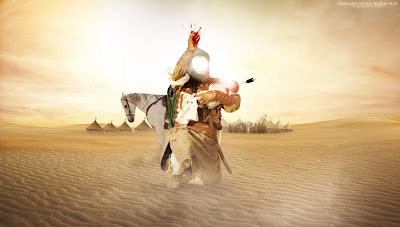 An arrow with three sharp heads flew across the desert of Kerbala. It was heading for Ali Asghar. Husain (a.s.) saw the arrow coming. He covered Ali Asghar with his arms. The arrow reached Husain (a.s.). The arrow went through Husain's arm and lodged in the tiny neck of Ali Asghar. Poor Husain (a.s.), the poor father, who came to get water for his little child. Instead of water, Ali Asghar got an arrow in his neck. What shall Husain (a.s.) do now? What shall Husain (a.s.) do now? Husain (a.s.) gently pulled the arrow from Ali Asghar's tiny neck. My fellow Husaini, put your hand on your heart and imagine the scene - a father removing an arrow from his child's neck. What a tragic scene! Blood gushed out from Ali Asghar's neck. "No Husain (a.s.), do not let the blood gush towards the sky, otherwise, no drop of rain will ever fall from this sky." The sky is refusing, the earth is not happy to accept Asghar's blood. Poor Husain (a.s.) wiped Ali Asghar's blood on his face. Husain (a.s.) started walking towards his tents. He saw Ali Asghar's mother - Umme Rubab - standing by his tent. A mother anxiously waiting for her baby. "How can I face Umme Rubab? What shall I tell her? How can I tell her that her baby has been martyred without water? How? How?" "INNA LILLAHE WA INNA ELAIHE RAJEOON." He finally reached the tent where Umme Rubab was standing. "Rubab, come and take your Ali Asghar. Rubab, your little soldier has died for the sake of Allah." Umme Rubab took her little child, Ali Asghar. She hugged him and cried her heart out. "Come with me Rubab. Enough, Rubab, enough. Let us bury our baby Asghar"
Husain (a.s.) and Umme Rubab walked to the back of the tents. Husain (a.s.) dug a small grave with his sword, the Zulfiquar. Umme Rubab placed Ali Asghar in the small grave. My fellow Husaini why should we not cry tonight? Why should we not do matam tonight? Have we ever heard of any other father and mother digging a grave and burying their own child? Where can Husain (a.s.) get water to sprinkle on Ali Asghar's grave? There is no water to sprinkle on Ali Asghar's grave. Husain (a.s.) sat by the grave crying. Tears poured on the grave. Ali Asghar's grave was sprinkled with Husain's tears.